…A simple bell. Purple. Made of metal, on a stand, maybe chest high for most people. Nothing special about it, or so it seemed. I walked by it many times without noticing it. Once I finally realized it was there, I walked by it many more times, never really looking at it. Until finally…I rang the bell. I took a deep breath and pulled. Hard. Back and forth I shook the clapper. Instantly the air was filled with joyful, laughing, triumphant music. Could it be? Could there be magic in that bell? My arm tingled, and at the same moment my leaden legs and feet came to life. They took off running, totally of their own accord, after plodding along at a slow walk for over two days. Yippee!!! Yes, I really was floating…how can you call it running if your feet aren’t touching the ground? I signed up for the Snowdrop 55-Hour Ultramarathon because my brother Dave decided to run it. Dave started running a year or so after I did, in 2010 I think. I joined him for his first half-marathon, the 2011 Winslow Run. We both had a blast. Then Dave started running ultramarathons (races longer than 26.2 miles). I always figured I would run an ultra with him. Someday. Then, at age 44, Dave got cancer. Specifically, Stage IV papillary renal cell cancer. Dave still runs ultras. But now he has to choose races with especially generous time limits. (In 2016, he finished the Prairie Spirit 50 and the Pumpkin Holler 50K, and was the Epic Ultras Featured Runner for April.) So, when Dave chose the Snowdrop 55 for his fall race, I had to sign up. If I were ever to attempt an ultramarathon, this was the perfect race to try. 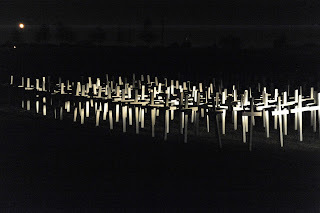 It would be in Sugar Land, Texas, about an hour from my house. It supports a great cause, helping kids with pediatric cancer, through research and college scholarships. And, instead of a fixed-distance race on a trail, this was a fixed-time race, round and round a 0.74668-mile jogging trail at a park. No danger of getting lost. No danger of getting stranded on a mountain in the middle of the night in a rainstorm, miles from the next aid station. When I inevitably flaked out, I would be right in the middle of civilization. Wal-mart and Denny’s were right down the road, all my stuff would be immediately at hand. I could take a break, even go home, whenever I liked. And, one last plus: the race would begin on December 30, Dave’s birthday. It was perfect! I had no intentions of showing up for Snowdrop completely untrained. When we registered back in April, I figured I had plenty of time to lose my dissertation weight and regain my ability to slowly run 15 miles or so. But life and work intervened, and the training plan never materialized. Summer running was decent, but this fall I ran once or twice most weeks, some weeks not at all. Snowdrop did motivate me to get in a few longish runs that otherwise wouldn’t have happened, including a 20-miler in early December. (Dave said that if I could run 20, I could run 50…I couldn’t prove him wrong unless I ran the 20. After my 20-miler, he said, “okay, now you're trained!”) Dave also says that training is overrated. Guess there’s one way to find out! 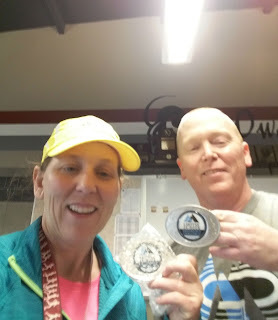 So, the last weekend in December was to be my Someday to run an ultra with Dave. What did it matter if I was trained? But Dave couldn’t come to Snowdrop. Because of the cancer. Or the cancer treatment. I knew Dave would give almost anything to be able to do this, so I might as well give it a go. I knew I would regret skipping it more than I would regret trying it. So, off to Snowdrop I went. 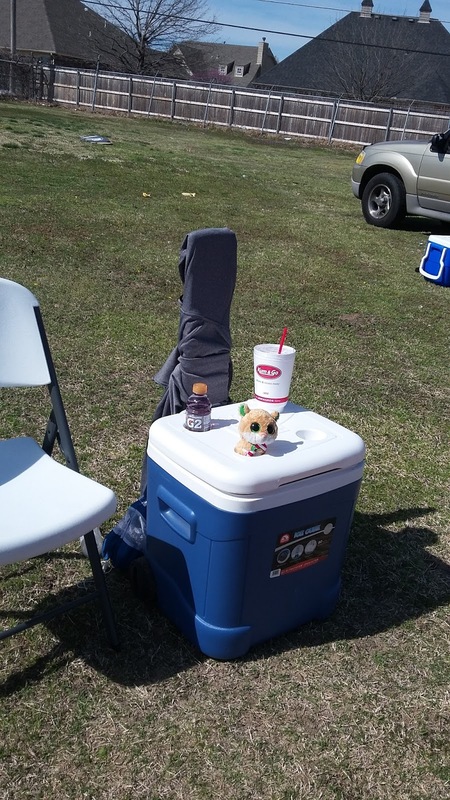 The first step was packet pickup on Thursday afternoon, at the park where the race would be held. The goodie bag was awesome—shirt, hat, waterproof bag, blister cream, KT tape, headlamp, hat, gloves, blanket, and more—tons of fun stuff, all packed in a high-quality duffel bag. I had paid for a tent cubicle with the race registration. We were supposed to check into the tent cubicles at the packet pickup, but the race organizers said it was too windy to set them up—the Boy Scouts would set up the tents in the morning. That was fine, it would give my crew member (hubby Scott) something to do while I was running. Armed with that helpful wisdom, I packed my stuff for Snowdrop. I gathered all the warm clothes that I could possibly think of. When I ran my 20-miler, it was dark and about 50 degrees Fahrenheit and I didn't even need my jacket, so I felt well-prepared for the temperatures that were predicted. The pre-race meeting was scheduled for 6 o'clock Friday morning. It was dark and chilly, but the race director was super peppy and it was rather fun. She gave us our instructions and announced there would be something very moving at the start of the race. I was looking forward to that. In the meantime, I enjoyed listening to everyone’s excited chit-chat. I didn’t know anybody, but there were plenty of friendly faces and I felt right at home. 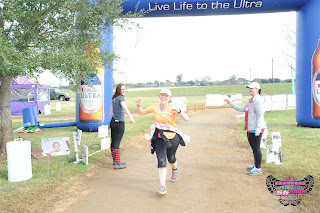 So much to take in—my first ultra…I still can’t believe I got myself into this. Oh, what a fun surprise….Dave had told me his friend Karen would be here, and sure enough, she managed to find me and introduce herself! We had fun visiting and took a picture together to send to Dave. Finally, start time arrived. I knew I would be slow, so of course I lined up near the back. The Snowdrop was a fantastically run race, almost nothing to criticize. But if I could make one suggestion, it’s that I wish races would put a big speaker near the back of the pack at the start line. It happens at pretty much every race. Everyone is talking, which is fine when nothing is going on yet, but because of the talking no one can hear the announcement that it’s time for the Star-Spangled Banner and any speeches or introductions. So the back of the pack always misses everything. By the time the national anthem was halfway done, everyone stopped talking and we could hear, but we totally missed all the stuff before that, including the part the race director said would be really moving. I think the race organizers probably test their public address system when no one is there, and they can hear it just fine from way behind the starting line. But you can’t hear a thing when people are talking. We back-of-the packers are just as respectful and patriotic as the fast people—we would never intentionally talk through the announcements or the national anthem. We heard over half of the national anthem, and many of us sang along (very quietly, because we wanted to hear the wonderful singer). And then we were off! Every other race I’ve done, a bunch of people took off fast—that didn’t seem to be the case this time, I wonder why? 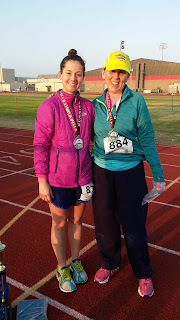 The race got off to a fun start for me, because the first person I talked with turned out to be a faculty member at a community college on the other side of town from mine. (Veroon, rhymes with maroon, he said—that helped, hopefully I got close on his name.) We walked the first few laps together and had a great visit—it is always fun to swap stories with other community college faculty, and find out how our institutions are and aren’t the same. He was doing the relay so he stopped after a few laps. I hoped to see him again that evening or the next day, but I never did. The most awesome part of this race was all the neat people I got to talk to. If I’m going to spend 55 hours doing a race, I’d much rather it be round-and-round instead of point-to-point…you can walk laps with lots of different people, instead of them just passing you once and never seeing them again (not that I’ve ever done a point-to-point ultra, of course….shudder). 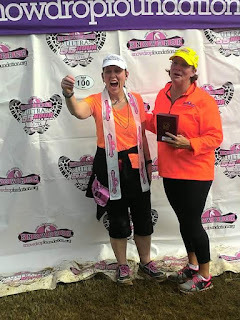 When I signed up for the race, I thought of it as a 55-hour race and assumed everyone would be competing to get as far as possible before time ran out. 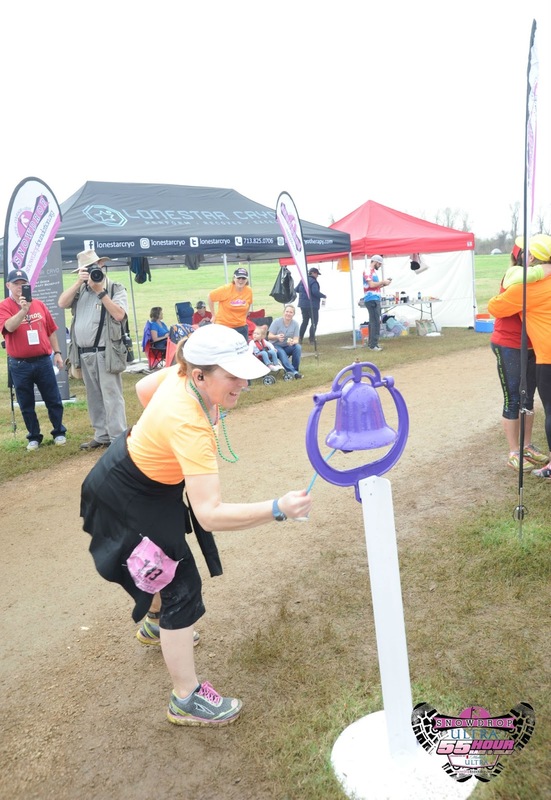 As I walked and talked during the race, I learned that almost all the participants thought of it as a 100-mile race with a 55-hour time limit. In other words, “finishing” meant 100 miles for most people, although some of them intended to do some bonus miles after they finished. By the way, I’ve discovered that it’s way more difficult to write a decent race report for a 55-hour race than for a run-of-the-mill road race. It’s almost a microcosm of the dissertation-writing process—the thing you’re trying to write up is ridiculously big, so you have to somehow include enough detail to convey the flavor, without sucking the life out of it. The only option is to try to distill it into highlights, which means throwing chronological order out the window. (I can’t remember the chronological order anyway—too many hours of cold and exhaustion, plus notetaking was rather difficult.) It’s pretty much doomed to not make any sense. After Veroon, I walked and talked with several other people. Eventually, I started interspersing a little running—I tried to run half of every other lap. I wasn't very well trained and I’d never done a long race, so I had absolutely no idea how many miles were realistic for me. I was pretty sure I could get to 30; when I did the 20-miler, I was very tired and ready to be done, but nothing really hurt. If I’d had a good enough reason, I could have walked another 10. After a few laps, I stopped to chat with hubby Scott. He wore his official Crew badge with pride and seemed to be enjoying himself. He had checked into my tent, and got all my stuff moved inside. Instead of a cubicle in the “bunkhouse”, I had my very own tent! Apparently one of the two tent bunkhouses had got damaged, and the race organizers made a late-night trip to Walmart to buy a bunch of small tents to replace it. A big “thank you” to the unseen but greatly appreciated Boy Scouts who set up the tents for us. Mine worked great! Scott used the power inverter in the car to blow up my new air mattress. We were very glad we didn't borrow an air mattress from the friend who offered it, because it would have ended up getting muddy. Better to have our own. I kept moving all day. Everything blurred together. I had no idea how long it would take me to get to the halfway point. If possible, I wanted to get more than halfway (to 100 miles) the first day—I was still entertaining hopes of getting that belt buckle. But I was already cold, and the temperature kept dropping. (A couple people told me how glad they were to have such fantastic weather, way warmer than last year! Yea, I felt like a wuss.) It was supposed to be cold and rainy all weekend. I wanted to get as far as possible before the expected rainstorm arrived. I kept walking, and running off and on, pretty much all day and night. They gave us lunch around noon, and dinner around 6 or so. The pasta and salad we got for lunch was delicious. The fajitas for dinner were okay, but mostly I was glad to take a break in the warm food tent. There weren’t enough places to sit, and my feet were sore. I was so grateful when I spot at a table opened up. It felt wonderful to rest my feet and get warm!! I took my time, and visited with another new friend over fajitas. I especially enjoyed walking with people who had been actively involved with the Snowdrop Foundation for a long time. I heard over and over what a fantastic charity it was—low overhead, almost all the money going to the kids. Truly a labor of love. Scattered along the track were photos and names of some of the kids fighting pediatric cancers. Nice. Near the beginning, I walked with Debbie, who described how she had picked up some miniature chandelier ornaments for $1 each at an estate sale. Two of the Snowdrop volunteers got into a bidding war for them (apparently they resembled the chandelier in one of their houses). 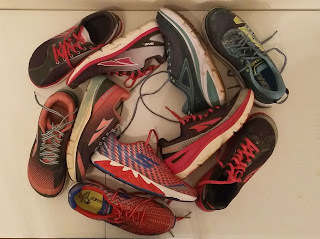 They each bought one for $250, and they decided that whoever ran the most miles at the Snowdrop 55 would get the rest. The little chandeliers were hanging outside of a couple of tents; Debbie pointed them out to me. So, those $1 ornaments turned into a bunch of money for the Snowdrop Foundation. Cool. Later, I walked with Frank, who told me more about Snowdrop’s various fundraising efforts, how they reached out to individual kids with cancer, and different ways I could get involved. No one seemed bothered by the fact that I had not gotten around to doing any fundraising, they just wanted to share Snowdrop’s vision and mission. My primary motivation in registering was to run a cool race with my brother—I was glad our registration fees supported a good cause, but the cause wasn’t the reason I did it. Now that I know more about Snowdrop, I would like to do more than just contribute a race fee. If I do this next year, I’ll give the fundraising a go. And I’ll keep my eyes open for opportunities to support Snowdrop in other ways. So, I enjoyed walking with lots of interesting people. But it kept getting colder and colder. I discovered things that I should have already figured out. Such as: run/walking 20 miles when it’s 50°F degrees is completely different from walking (with no running) 48 miles when it’s 50°F. Even a very small amount of running generates a lot of body heat. Walking doesn’t. Plus being out there so long just gets you colder and colder. It seems to go on forever. Especially at night when it’s dark, and most people have gone to sleep, and there’s no conversation to distract you from how cold you are. I wore what I thought were warm pants but they weren't working, and I was freezing. Fortunately, I had a crew member! I stopped at the tent and asked Scott to find me a hoodie. I had only brought my thin running jackets, nothing as warm as I needed. So he went to Academy to look for a hoodie. He texted me about sizes—I thought an XL would be too big, so he brought me an L. Not big enough to fit comfortably over all the layers I was wearing, so back to Academy he went. He was a very good sport about it. I ended up with this awesome XL blue Nike hoodie. Extra-long arms with thumbholes!! Three weeks after the race, I still love it—it is SO comfortable. During the race, it was heavenly. Wow, what a difference that hoodie made. Along with the hoodie, I wore two pairs of gloves, arm warmers, a long-sleeved shirt, and a running jacket. I also had my baseball hat and my ear warmer headband. It took me a while, but I finally figured out that you could raise the hood on the hoodie, and that makes you a lot warmer. Yea, three college degrees, including one in engineering, and it didn’t occur to me to raise the hood on the hoodie. Sad. As I trudged along, I admired the people who were still running. (In this paragraph, running = actual running, not walking. Elsewhere, running = propelling oneself forward via legs.) Some of these runners were amazingly fit. I had no idea it was possible for a human to run so long without a break. The first half of the day I noticed a guy (Jered, it turns out) who was wearing nothing but shoes and running shorts when most everyone else was bundled up. He was fast, and kept it up for a long time. I learned that he was a pediatric cancer survivor and had covered 175 miles at last year’s Snowdrop. Another guy I noticed, not because he looked fast, but because he just kept going round and round, same steady pace for hours, hardly any breaks. And actually he was pretty darn fast considering how long he’d been at it. I learned later that his name was Joe and he was the first American to run 600 miles in 6 days. He ran 250 miles in last year’s Snowdrop. Mind-boggling. And I never saw him with a pacer. There was a gal who didn’t seem as obviously impressive at first but then I noticed she kept running round and round and round also, at a pretty decent clip with hardly a break. Later, someone told me that she had been the national Ultrarunner of the Year a couple years back. Her name was Connie. I was totally blown away at how anyone could keep running so long. They hardly ever stopped, they just keep running and running. Round and round they went. Wow. It got dark and I felt colder and colder. I was wearing long pants that had been sufficient for every running expedition I’d ever done in Houston, but they weren’t enough tonight. So, Scott went to Walmart and bought me a big pair of cheap men's sweatpants. 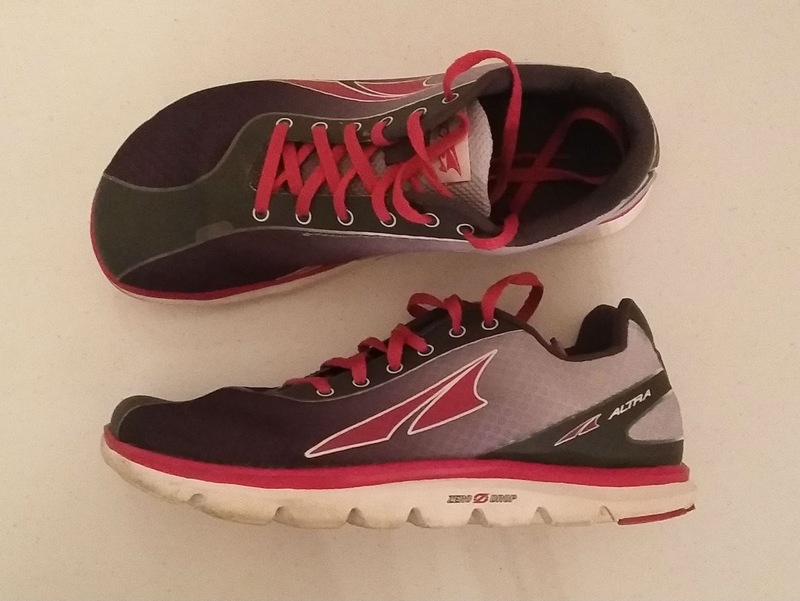 They were a lifesaver—I pulled them over the top of my running pants and I felt immediately so much better. We discovered at this point how much I actually needed a crew member. I had no idea someone as slow as me would be so high-maintenance. It was such a hassle to get in and out of the tent and find things, and it was just really helpful to have Scott there. But he would need to sleep sometime. After he got me the sweatpants, I knew I would be okay for a while, so he went home to sleep a few hours and walk the dog. He realized I was going to need him tomorrow, so he got on the phone to work on dog-walking arrangements. After Scott left (late Friday night), I mostly walked, but still occasionally would run a half-lap or so, mostly just to get warm. I didn't really feel like running, and I didn't want to go too fast because I knew too much running would kill any chance I had for the belt buckle. I really wanted to get to 50 miles the first day. The first 50 are bound to be easier than the last 50, right? I was likely to slow down the second day, so my only hope was to get past 50 the first day. Especially considering it was expected to rain all Saturday morning. I left the tent just after the rain stopped, around half past noon. Of course, I had missed breakfast, so I grabbed a granola bar and started walking. I didn't even try to run the second day. I just walked and walked. I worked out the time and knew my only hope was to walk nonstop until Sunday afternoon. I was only halfway to my 134 laps at 12:30 p.m. on Saturday. The first 50 miles took me over 22 hours, and that included some running. I knew I would not be able to run much the second half, so it would take longer. I would have to walk all day, then walk all night until sunrise, and then keep walking until it was over. If I slept at all, I would run out of time and miss out on my belt buckle. Saturday was lonelier than Friday…lots of people disappeared during the night. The track was soaking wet. I splashed through lots of puddles and my wet feet were freezing. But after a while, the weather actually warmed up a little, which was really helpful. After my feet got soaked a couple of times, I took off my wet shoes, dried my feet, dusted them with baby powder, and put on new shoes and socks. I think this was Pair of Shoes #3. My dry feet felt so awesome, I wanted to keep them that way as long as possible. I started taking care not to walk directly in the puddles—I tiptoed through on the semi-dry places, or picked my way through the grass. That helped tons—my feet were damp instead of soaked, which kept them warmer. I kept walking, walking, walking. I kept looking forward to the dinner signal, not so much because I was hungry but because dinner time was another milestone along the way. When it finally came, I didn't stop. I was afraid I didn’t have time to stop, so I just ate a granola bar. Scott checked out the dinner menu and told me he didn’t see anything I would like (hmmm….I believed him at the time, but maybe he only said that to keep me walking.) He went to Subway twice for me. The second time, he brought me two foot-long sandwiches. He got Subway to cut them into thirds, so I could have a manageable piece whenever I wanted. I put them right inside the tent door, and they kept me going all through the night (while Scott slept in the car). It wasn’t long before the sun went down. It was warmer than the first night and there was no more rain. As it turned out, I had slept at the optimal time—I slept the entire time it was raining, and started walking immediately after the rain stopped. Beginner’s luck, maybe? Throughout Saturday afternoon and evening, the track gradually got better and better. I started to figure out where to walk. It was a porous surface, so the standing water started to drain, plus some of the dirty water went home on people's clothes. A few places were a little slick but I was so slow it didn’t matter. I kept walking past sundown and into the evening. I don't even remember all the people I walked with, and I sure as heck don’t remember the times or the order. One of the most interesting was Don. He has run ultras in 17 countries (more or less, he couldn’t quite remember them all) and he holds at least one age group record for running certain distances. It seems he's run ultras forever—he is up to 14000 official race miles and that only counts races at least 50 miles long. Marathons don’t count. He finished the TransAmerica race across the U.S., the final time it was held. Don told me all sorts of stories. Pretty much every Don story would take at least two laps, so he was a great person to walk with. Feral cat stories might last four laps each. It was Don who pointed out Joe and Connie and told me about their awards/records. A week or so after Snowdrop, I got a cool surprise …I picked up my September 2016 issue of Texas Runner and Triathlete, which had been laying around unread, and guess what?...a feature story, an interview, with Don Winkley, Unknown Texas Ultrarunner and “the best Texas ultrarunner you’ve never heard of.” I am so glad I didn’t read it in September when it came, as it wouldn’t have meant anything to me then. It was so much more fun to flip it open in January and see Don’s picture and exclaim, “wow, I walked with that guy!” I learned from the magazine that Don started running at age 38, when he decided running was a better midlife crisis option than a mistress or a Jaguar. That makes all he’s done even more amazing. I also enjoyed walking with Bill. He was trying to finish his hundred miles by Saturday night, because he was running a marathon in Kingwood on Sunday. He was a veteran and a kidney cancer survivor and seemed an all-around awesome guy. He was a fast walker too, so I made up some time when I walked with him. I missed seeing his 100-mile finish, but I heard it announced over the loudspeaker. I didn’t know Bill’s last name, but all the stuff the announcer said about him matched what Bill told me, so it must have been him. I looked for him in the food tent next lap, but didn’t see him. That’s okay; he was a pro at this and didn’t need any congratulations from me. I also walked with Cathy. Scott and I saw her sitting at the picnic table when I went to change shoes and she was near tears. She said this is the point in the race where she always broke down, because this is where her husband would always tell her good luck, and he wasn’t there anymore. Apparently he headed out to run a 5K race a couple months ago, and he never came home. His heart. So hard. But Cathy is filled with grace and strength. And she got her hundred miles. I had finished a lap just before she got to her hundred and I saw her coming. Scott had been keeping an eye on her the whole time and checking on her, and so he told me when she was on her second to last lap. He wasn't going to go home until we saw her finish. So I took a break and watched Cathy finish, and gave her a big hug. I was so glad we met her. Cathy, hang in there…you’re so special. Saturday night was New Year’s Eve. Scott was originally planning to spend the evening at our fellowship group’s New Year’s Eve gathering, but he decided to stay at the race with me instead. Neither of us had realized how much I would need a crew member. He asked some to walk our dog on their way home from the New Year’s party. My mom volunteered to dog-walk Sunday morning, and also to grab the lawn chairs from the house and bring them to the race. It had never occurred to us that we might want to sit on something during a 55-hour race. On one of his Scott’s Walmart expeditions, he bought a little folding stepstool for me. That was a huge improvement inside the tent. If there’s nothing to sit on, you have to crawl on the floor, which is rather difficult when your knees are stiff and sore from walking 50 miles. I finished a lap at about 11:55 p.m. on Saturday, perfect timing for New Year's Eve. Everyone was pouring sparkling cider in the food tent. I opted to toast the new year with hot chocolate instead. Everyone was bubbly and smiling…it was fun. But I had no time to spare, so I started walking as soon as I finished my hot chocolate. Scott spent most of New Year’s Eve night sleeping in the car. While he was getting some Z’s, he charged our little battery packs, so that I could keep my phone and iPod shuffling for 55 hours. The battery died while he slept, but fortunately we had brought jumper cables and a spare car, so it worked out fine. He said quite a few people were sleeping in their cars. After the celebratory break at midnight, I kept walking and walking and just more walking. The night seemed so long. I have never walked that long in my life, not even close. The track was pretty empty most of Saturday night. The few people on it looked tired (except for Joe and Connie of course—I believe they rested part of the night, but when they were out there, they continued running strong). I made myself keep walking…staring at the sky hoping to see pink wisps of sunrise. It seemed to take forever, but eventually, the night gave way to grayish-pink streaks, and with them…FOG! How beautiful! I love fog. And this was a great place to experience it. No buildings, so you could see the foggy billows roll in. And not just see the fog, I could feel it. My sore feet couldn’t keep me from beaming with silly delight. When I watched the sun come up through that Sunday morning fog, there was nowhere else I’d rather be. I walked all the way through, no stopping for breakfast. I got really excited when I got to 100 laps because that meant there were only 34 left. I have no idea what time that was. Somewhere in the night, my sense of time had completely abandoned me. I just knew I had to keep walking no matter what. Every so often I would go and change socks and baby-powder my feet. Scott had left me a giant back of clean socks. My feet had really ached a lot the first night too, but after I woke up they felt fine. Scott told me I looked much brighter and cheerier the second day, after I had slept through the rain, compared to how I looked Friday evening. That seemed odd to me, because I was really tired. 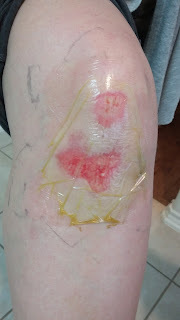 But I really did feel like I got a fresh start on Saturday morning (well, afternoon actually….I started walking about 12:30), and I was able to walk quite a long time before I got tired and my feet started aching again. It was pretty motivating to be on the downhill side, and to actually see myself getting closer and closer to 100 miles. While I walked, I kept working out the calculations to see if I really could get to 100 miles before the cutoff, and if so how much wiggle room I had. It seemed I had enough time to do it, but I didn’t trust myself. The evening before, we had calculated that I had about 5 hours to spare. But I had slowed down since then, and now I figured I had less than two hours of wiggle room, and I wasn’t even very confident in that. I had no choice but to keep walking. I didn't stop for breakfast or even a snack. They had bacon and eggs, which would have been just awesome, but I didn’t want to risk taking the time. I kept walking, the sun finally came up, and I gradually warmed up. After Scott woke up and took care of the car battery, I asked him to check my math, and figure out whether I could make it to 100 miles at my current pace. He said I could, and he promised to keep up with my splits the whole time, and to tell me if I slowed down too much. On Sunday morning, some people we were walking really strangely. It was obvious they were hurting and having an awful time. Some of those who looked the most miserable were the people who had been running really well early on. Some were getting worked on at the medical tent every couple laps; some were half-carried by other people; some were all crooked and scrunched up as they walked. It actually worked out to my advantage to be completely unfit and untrained. 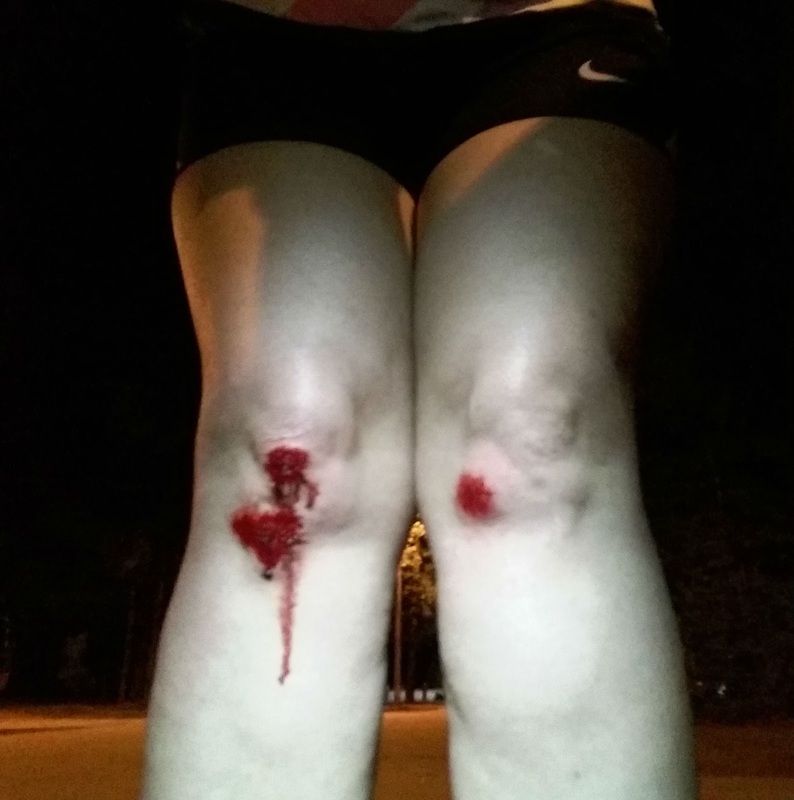 Because I was so unfit, I was very cautious and scared to run too much. Because I was so conservative at the beginning, I still felt pretty good for nearly all the last half. After the sun rose on Sunday morning, it started to get festive. People were finishing, and all the people who had gone home or to their tents to sleep had come back to watch the end of the race. 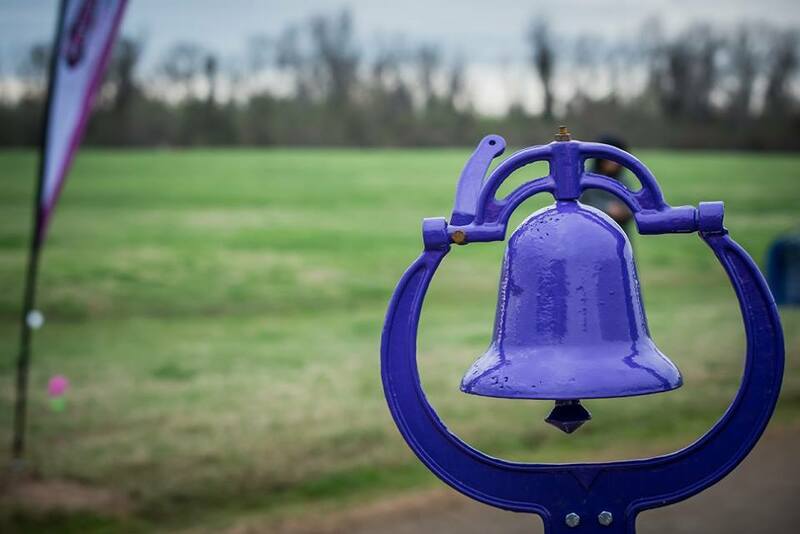 It turns out that there's a bell that everyone got to ring right before their last lap before 100 miles. Maybe they explained this at the beginning, but if so I missed it. I kept thinking if I can just get to the bell, I would be super-excited. I could hear people ring the bell and I could hear everyone celebrating at the finish line, but I felt pretty miserable. I kept slogging along, trying to ignore my aching feet. Oh and here’s one of the coolest parts of the race. Becca. Ever since that (temporarily) lost lap on Friday night, I had been careful to look at the little TV screen to see my name scroll by and check my lap total. It was hard to see your name because it was on the far left, but you could see the hometown right next to the lap total. My hometown was Tomball and there weren’t too many Tomballs, so that worked out okay for me. I could see Tomball 120 laps, 121 laps and so I kept looking for that. But my brain was getting tired along with my body, and every lap it got harder to see Tomball’s progress. All this time, those two running machines Joe and Connie just kept running all night long. Just going and going. Jered too. Joe never had a pacer, he just ran by himself, round and round, splashing through the water and never seeming to mind. He seemed to be going the same speed he was at the beginning. I hardly ever saw him walk. Don, the guy who had run across the U.S. and who told me all the cat stories, said that Joe had decided to only do 200 miles this year (he did 250 last year), because he was obscenely unfit and overweight. (Joe’s words, I expect.) Someone walking with us disputed that assessment, but Don said Joe really was unfit and overweight, compared to when he ran the 600 miles in 6 days. Don said the 600 miles went to Joe’s head and he started eating too much. As I kept walking, I got closer and closer to the end, but I was feeling tired and miserable and sorry for myself. I knew I was just being a wuss, because when I objectively evaluated my body parts, the only part of me that hurt were my feet. And the feet were really just a dull ache, no real pain and no sign of injury. 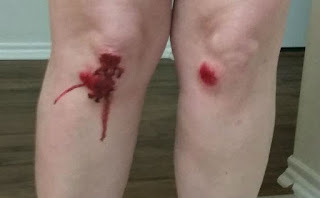 My knees had given me twinges of pain starting around mile 40, which concerned me at first, but they didn’t get worse and actually improved as I walked more. 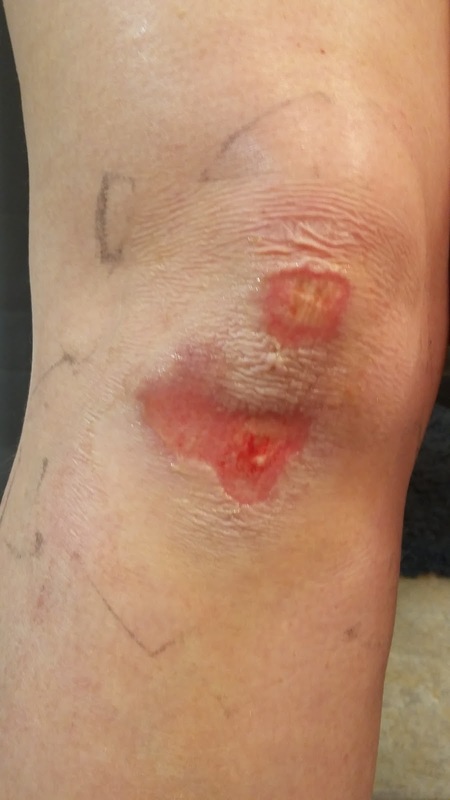 The knees seemed pretty much fine once I got past 100 laps. Karen (Dave’s friend, and now my friend too) had stopped at 71 miles, but she kept her timing chip on in case I needed her to pace me. She kept asking, “Jennifer, do you need me to go out and do a lap with you?” I felt miserable but I kept telling her, “not yet, maybe next lap.” It turned out I never needed her, and I just did my own thing. When I had five or six laps left, I whined to Karen, “my feet hurt” and I was just about in tears. I switched shoes and they still hurt but I kept walking. About four laps from the end I switched shoes for the last time. I kept thinking, “I can do this….three laps to the bell, four laps to the buckle”. Every time I went by the start line, my friend Becca was there to check my laps. Here's one more cool thing about Becca, and this is out of order. When I was maybe about Lap 124 or so, I and I had passed the start line and was down at the far corner of the track, I saw Becca running toward me and calling my name. She ran all the way across the infield, through the mud, to tell me that if I kept doing 27 minute laps I would run out of time and miss out on my belt buckle. After I passed the start line, she had seen my 27-minute lap time and worked out the math. I reassured her that the last lap was so slow only because I had taken a bathroom break and switched my shoes….most of my other laps had been quicker. But wow… Who runs all the way across a muddy field to tell a total stranger that she needs to speed up if she’s going to make it? I was so tired and grateful I started crying…I didn’t even know her and she was so kind to me. So finally, I came up on my bell lap, Lap 133. 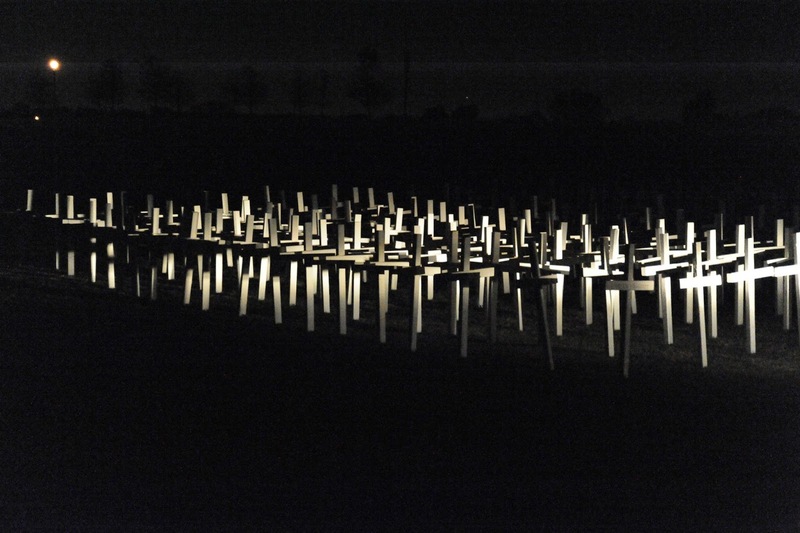 When I got there, I double-checked with the timekeeper, “you guys have it right, you’re not going to change your mind, are you?” and they promised me that no, they wouldn’t….there really was just one lap between me and 100 miles. So I ran over to that bell and rang it as hard as I could. Then I took off running. I hadn’t run a step since around mile 47, right before I went to bed in the tent. I ran all the way around the three-quarter mile track. My last lap was my fastest lap of the whole race. I ran past some walkers and yelled, “there's magic in that bell! …just keep going!” Don the photographer high-fived me about fifty yards from the end, and then he got out of my way so I could run in. 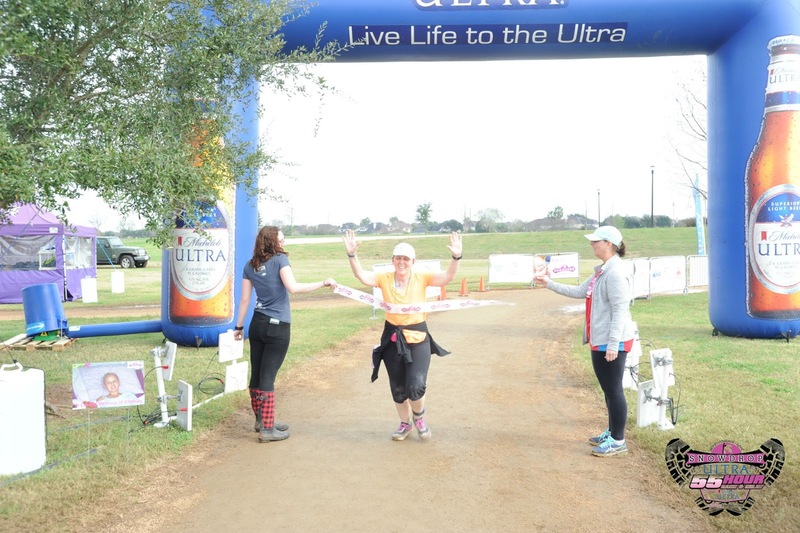 And then….the most amazing surprise: two people (one was Becca) were holding up a finish line tape for me to run through. How cool is that? Yea, I got to break a finish line tape. Definitely a first for me. Pretty soon after, they had a little ceremony for me and a couple others who recently finished. They had me stand in front of a big Snowdrop Foundation banner, and the race director presented the belt buckle. I can’t remember if she opened the container or if I did, but it contained a surprise: a 100 sticker for my car!! I just waved it around…I was so excited. I was still wearing my finish line tape (they let me keep it). Finishing was the funnest thing and I had an absolute blast. I was so thrilled. I couldn’t believe I was able to run the last lap after walking so far. I hoped the people I ran past didn’t think I was showing them up—some of them weren’t walking very well. I hope they knew that I didn’t mean to be unsportsmanlike or disrespectful; I was just so excited I couldn't contain myself. Anyway, I had a really great time at the finish line. We took pictures, and then it was done. I plopped myself into one of the lawn chairs my mom brought. That made my feet very happy! I watched a few more people finish and get their buckles. I watched Connie and Jered finish; they ran fast laps right until the clock ran out. Exciting. (Joe and Connie both got 202 miles, and Jered got 179.) It finally started to sink in that I am a 100-mile race finisher. Unbelievable. What an incredible experience. I looked again at the big Snowdrop Wall of Fame banner I’d seen at the race meeting. It listed the belt buckle winners from last year’s race. There was Joe with 250 miles and Connie with 200, and a couple other people at 200 or just under. And then there was a list of all the 100-milers, including my new friend Karen. And so next year, if they do the wall of fame again, I’ll be on it. Pretty cool. Anyway, that was my race report. If you managed to slog through the whole report, I’m sure you’re almost as glad to reach the end as I was to reach the end of my race. All in all, a marvelous experience. I am so glad I did it. Next year will be even better. Dave, you’re coming, right? It took me just over 22 hours for the first 50 miles, then about a 7-hour break, then I walked almost 23 hours to finish. Bring a hard chair for the runner to sit on, one that is easy to get in and out of without bending legs. Or a box or a cooler. Anything. Also a small box or stepstool to sit on in the tent. No one wants to kneel or sit on the tent floor after running or walking 24+ hours. Bring a chair for the crew member to sit on. How could anyone not think of this? If you use your car for extensive phone charging, run the engine. Clothes that work for run/walking 20 miles in the cold are not sufficient for walking 24+ hours at the same temperature. Plastic bags, with LABELS. Don’t put like stuff together. Put stuff that is needed at the same time together. For example, the baby powder goes with the socks, not with the toothpaste. Even if you own several pairs of running shoes, buy more. Preferably different models and different brands. Make sure some of them have extreme cushioning. Try something hard. Something you have no idea whether you can do. Something with a high probability of failure. Just keep plodding. Even if you are severely lacking in speed or competence, you can accomplish a lot if you just don’t stop. The best parts of a hard journey are the unexpected friends you meet along the way. None of us knows what tomorrow holds. If there’s something you want to do Someday, do it now.